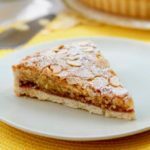 How can we travel through French cuisine without mentioning this fascinating dough that is puff pastry, the basis for the famous French pastry called millefeuille or Napoleon? Up until our grandmothers’ generation, making puff pastry was an essential baking skill. 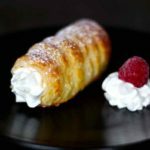 Nowadays, with all the available pre-made puff pastries that can be found in supermarkets, making your own puff pastry is often considered to be the realm of the domestic goddess. Mastering the technique of puff pastry has long been a mandatory rite of passage for going from simple cook to expert. It is a long and laborious process to roll the dough and let it rest. However, most chefs use shortcuts to make puff pastry with equally satisfactory end results. At the end of the day, the technique remains the same. Only those endless rest times in the refrigerator can be skipped. 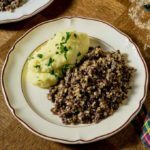 With its 6 rolls, and its close to 8 minutes of preparation total, the quick and easy recipe of our French culinary expert Chef Simon is, for me, the best recipe in the world. It puffs and swells at will. Pure genius from the Chef and voila. What is the origin of puff pastry? 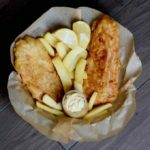 The paternity of puff pastry is traditionally attributed to French painter and confectioner Claude Gelée aka “le Lorrain” who lived in the seventeenth century. The story goes that le Lorrain made a type of very buttered bread for his sick father with a process of rolling the butter into the bread dough that created a finished product called “croissant”. Others attribute the origin of puff pastry to a pastry chef named Feuillet, private pastry chef of Maréchal de Condé who would have been the first to make this dough by giving it his “feuilleté” name, based on his last name (puffed/laminated in English). Several anecdotes and legends revolve around this puff pastry but one thing is certain: it was not until the 19th century that the illustrious French pastry chef Antonin Carême, in the entourage of Catherine de Médicis, took over the recipe of his predecessors and came up with the lamination and rolling method that we know today. 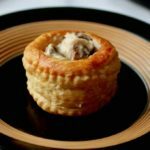 References to puff pastry, however, appear well before the seventeenth century, since its origins can be traced to Antiquity. The Greeks, who to this day, still use many layers of greased dough would be the inventors. 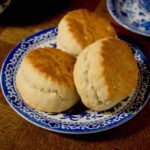 This baking technique then traveled to Rome and then made its wat to Byzantium. Yes, our puff pastry seems to be linked to filo (or phyllo) dough, that is used in a similar way to create layered pastries all over the world, and especially in the Middle East and in Greece with, for example, famous delicacies such as baklava, but also spanakopita, or prasópita. Muslim Spain (current Andalusia) has also adopted this technique of thin sheets of dough with olive oil and/or butter. In Spain, the first known dough recipe of puff pastry, as we know it today, with butter (or lard), appeared in the recipe book Libro del arte de Cozina (book on the art of cooking) written by Domingo Hernández de Maceras and published in 1607. He was a chef at one of the schools of the University of Salamanca. He introduced puff pastry pies and tarts, and even mentioned preparations with yeast. 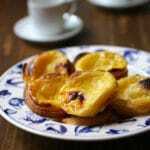 Thus, puff pastry seems to have been popular in Spain also at the beginning of the 17th century when the first French puff pastry recipe was published in Le pastissier François by François Pierre La Varenne in 1653. The Arab invasions during the Middle Ages already allowed to spread this technique of greased layering around the whole Mediterranean basin. 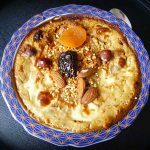 Some of the examples of the use of this technique include Moroccan pastilla, Tunisian briks in North Africa, or pastis gascon, feuilleté catalan, or Austrian strudel in Europe . So few ingredients for such a wonder. First, there is the “détrempe”, a mixture of flour, water and a hint of salt, which forms the base of the dough. 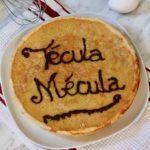 The secret of this institutional recipe lies in what is called “tourage” (turning), an operation which consists in folding, rolling and turning the dough several times to form several layers, enclosing the butter between the layers of détrempe. To make an authentic puff pastry, you must use dry butter that is also called also “beurre de tourage” (extra dry butter). But why are these dry butters better adapted to this recipe than the standard butters you typically find in supermarkets? Stéphan Lagorce explains in Tradition de miamologie Pâtisserie (Éditions Thermostat 6) that “these butters are butters with a high melting point and with less water content, so they look like clay, which is what you want for puff pastry.” In other words, in order for the layers of the détrempe to not stick and form a beautiful laminated result, the butter should not melt. Do not even try to find “dry butter” at your standard supermarket because the probability of finding it is nil. 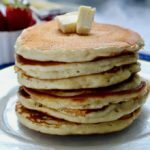 However, you might be lucky enough to find good dry butters at specialized stores or you can find recipes to make your own homemade dry butter on the web. How many sheets are in a traditional puff pastry? When a layer of butter is placed on a détrempe layer, a layer of butter and a layer of dough are obtained. Then, if you close the détrempe on the butter, as for an envelope around a letter, you will get two layers of dough and one layer of butter. If you stretch the whole thing and fold it in three (one turn), then you get 3 layers of butter and 4 layers of dough (when one layer of dough is brought close to another layer of dough, the two layers merge and become one). Then, if you stretch and fold again in three, you will obtain 9 layers of butter and 10 layers of dough. For the next turns (for a total of six), you obtain 27, then 81, then 243, then 729 layers of butter, and therefore 730 layers of dough! 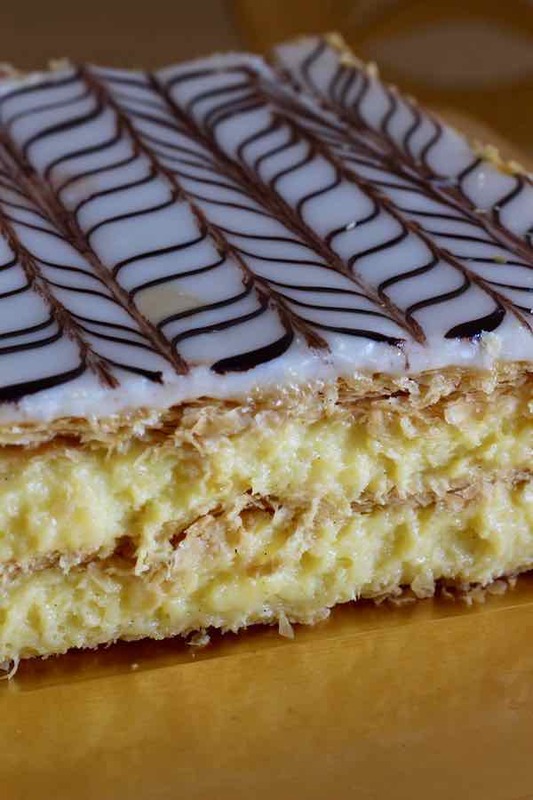 It is called mille-feuille, vanilla slice, custard slice, or even Napoleon. It is a pastry that is made with three layers of puff pastry and two layers of pastry cream. The top is glazed with either fondant or icing sugar. Some people even add fresh or dried fruits or jam. 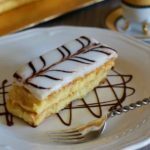 What is the origin of mille-feuille? The millefeuille was created by François Pierre de La Varenne, who described it in his Cuisinier François in 1651. It will be perfected by Marie-Antoine Carême, chef of Charles-Maurice de Talleyrand-Périgord that I told you about last week for my pâte à choux recipe. Carême heavily contributed to the notoriety of the art of French pastry. 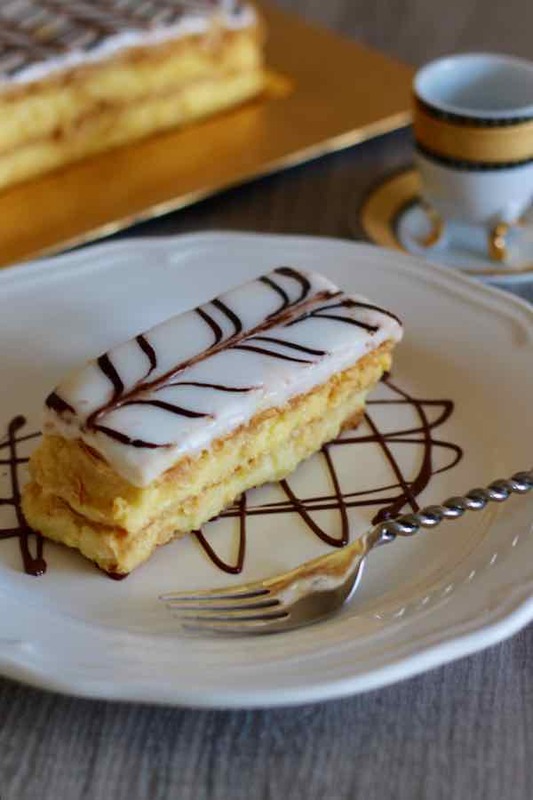 Obviously, the name of this pastry, millefeuille (thousand sheets in French), refers to the large number of sheets of dough that compose it. 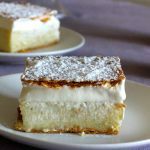 I prepared the millefeuille during a hot summer day and it was the perfect dessert to a light dinner. 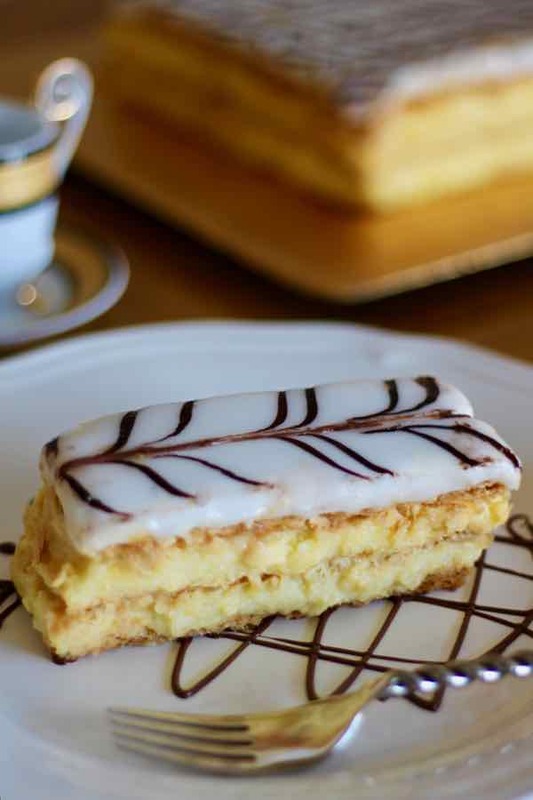 Millefeuille is a French pastry prepared with 3 layers of puff pastry and 2 layers of pastry cream, and that is covered with icing sugar or fondant. Place the flour on a work surface and make a well in the center. Pour the water in the center and add the salt. With your fingertips, incorporate the flour via a delicate and circular movement. When the mixture has a smooth consistency while remaining liquid, bring the flour with the dough cutter back to the center. The flour will absorb the remaining liquid. Bring everything back with the dough cutter by cutting through the dough and starting again until everything is incorporated. The dough cutter will allow mixing without developing the gluten, heating the dough or making it elastic. The détrempe is soft, sticky and has no body. To the touch, it is cold which shows that it has not undergone kneading, therefore the development of gluten and elasticity is limited. Form a cross or a four-pointed star with the détrempe and keep a bump in the center. Roll each branch of the cross with the rolling pin and place the dry butter on the center bump. The détrempe and the dry butter should have more or less the same consistency. Fold each branch carefully one by one to wrap the fat. Before folding the last branch, close lightly with the rolling pin to ensure a proper sealing. Stretch the last branch so that the dough is completely wrapped (top and sides). Spread the fat inside the dough by gently and regularly tapping with the rolling pin. The fat must be distributed evenly without breaking the dough. It is essential to form the first dough well. Continue patting with the rolling pin. Little by little, the dough will take shape. This will prevent the butter from permeating the détrempe and avoid an uneven lamination. Roll without forcing especially the first 2 turns. The dough is still fragile and must not tear. Flour lightly and remove excess flour with the brush. Do not force as the butter might pierce the thin layer of détrempe. The first turns are short. Fold one end of the bottom onto itself and remove excess flour from the brush. Fold the other end over the first two. It has therefore been folded into 3 equal parts. Make sure that the 3 layers are in front of you and weld them by pressing lightly with the rolling pin on each end. The first turn is over. Roll again to start the second round. Do 6 turns total. Wrap with a plastic wrap and cool for 2 hours. Bring the milk and vanilla bean to a boil. Blanch the egg yolks with the sugar in a bowl. Once the sugar and egg yolk mixture is well beaten, add the flour and cornstarch together gradually with a whisk. The mixture should be homogeneous and smooth. Add half the milk and whisk gently. The mixture should be smooth and without too many bubbles. Pour the mixture into the saucepan with the rest of the milk and simmer on low heat while whisking. When the cream is thickened, stop cooking. Dab the surface of the cream with a knob of butter to avoid the formation of a "skin" while cooling. Roll the puff pastry finely. Trim the edges and moisten with water using a brush. Poke with a fork and sprinkle with caster sugar over the entire surface of the dough. Place the dough on a baking sheet and place a rack on top to slow down the rise. Bake. As soon as a golden color appears (about 10 minutes), remove the dough from the oven. Turn the dough over, moisten and sprinkle with sugar again. Put the rack back on top and bake again for a few minutes until drying and light coloration. Cut the baked crisp dough into 3 equal pieces. Place the first piece on a work surface. Spread the cream using a spatula or a pastry bag. Place the second piece of puff pastry over the cream and repeat the procedure. Finish by placing the last piece of puff pastry on top. Fill any gaps with the pastry bag and smooth out with a spatula. Pour the white fondant into a pan. Heat and keep it warm in a bain-marie at a temperature between 98 and 102 F.
Melt the chocolate and keep it, also in a bain marie. Heat the apricot jam or honey in the microwave for a few seconds. 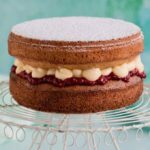 Brush the top of the millefeuille with warm jam or honey to allow the fondant to stick well. Gently pour the fondant onto the center of the surface to be covered. Smooth gently but quickly with a metal spatula. Prepare a small paper cone (or a freezer bag) and pour the melted chocolate inside. Using the cone, quickly trace parallel chocolate lines on the fondant, as regularly as possible. Do not allow time for fondant and chocolate to harden before marbling. Using a small kitchen knife, draw lines on the marbling in one direction and then in the other. If the fondant and the chocolate are not at the right temperature, the quick hardening will not allow to execute a beautiful marbling. Place the millefeuille in the fridge for 15 minutes to thoroughly harden the fondant before cutting. Use a bread knife and cut rather quickly so as not to crush the lamination or damage the fondant. To cut equal parts, use a ruler to measure.